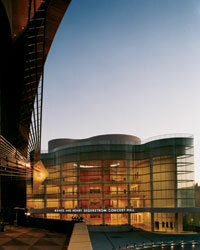 Performing arts enthusiasts can rejoice with the opening of the Atrium at Lincoln Center onNovember 12. The visitor’s space offers for the first time a one-stop box office for same-daytickets—some discounted—to all the performing arts organizations of Lincoln Center forthe Performing Arts. Located at 61 West 62nd Street between Broadway and Columbus Avenue, it isdesigned by architects Tod Williams and Billie Tsien, and has a restaurant and indoors gardens.